With this 16" round Stainless Steel (and not plastic) LED shower head you can experience the new style of showering. No electricity or battries are needed and no need to figure out installation since it can be installed in minutes, by simply unscrewing the old shower head and screwing in the new shower head, and no connections or adapters needed it is made to fit all US 1/2" standard fittings...that simple This high tech is self powered by water pressure and will automatically turn on the LED lights the minute you turn on the water. This 16" LED Showerhead changes colors to provide you with a new fascinating shower experience. The LED Showerhead comes in many finishes including chrome finish, brushed nickle, gold tone and oil rubbed bronze finish and the shower head has an adjustable built-in swivel connector so you can point the LED Showerhead in any direction. Simply you can turn on the fun in your shower just by turning on the water. Can be installed as Wall or Ceiling Mount. The threading is universal so it will fit any standard shower head by simply unscrewing the old one by hand and attaching the new one. 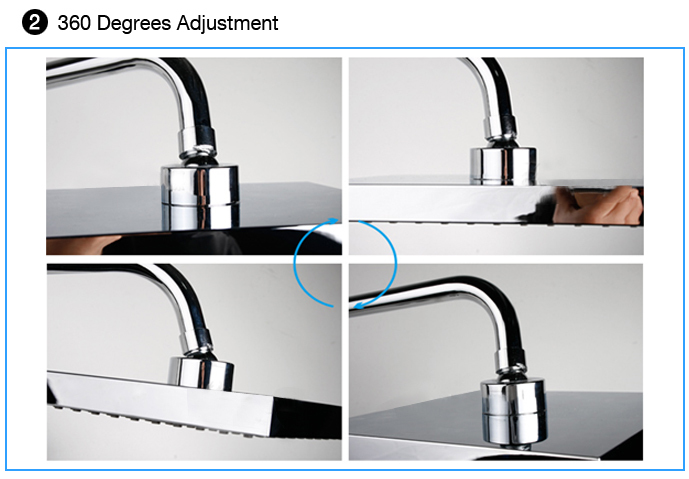 A shower arm is not included, and can be purchased separately. 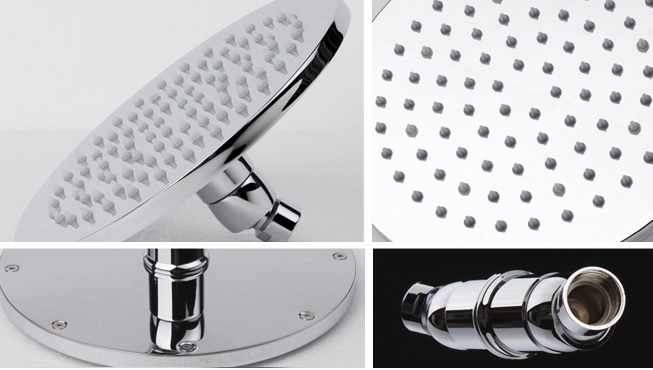 High Quality This modern shower head is made out of brass, so its made to last!! A great upgrade to any bathroom that can be installed easily in minutes. This stainless steel, color changing LED rain shower head in round shape and copper metallic finish is purely a treat for eyes. The quality and finishing is top notch and it looked as amazing as I had pictured in my head. The transition was easy and it functions in a great way. I didn't really think much about these LED shower heads at first, but I'm quite impressed with this one. The LED lights are pretty nice, though they aren't that bright at all. Anyhow, I'm quite happy with this shower head since it works well. This is the first LED shower head that I've ever had installed at home, and I haven't seen or actually used one before. Still, since I have the budget and it seemed pretty cool to have, I decided to get one anyway. And I'm really happy that I did. This shower head works great and the LED lights are just awesome. I truly believe that I got great value for my money with this purchase. What I particularly liked about this product was the variety of finishes. I placed an order for the gold one, and when it arrived, it looked great - the finish was just as I imagined it to be. The LED lights were really wonderful, and I don't think I've ever stared so much in a shower head before. Great product overall and worth every penny. If you haven't tried showering with an LED shower head before, then you definitely must try this. We did, and we were extremely satisfied with it. We were reluctant to order online at first, but when we saw how nice the customer service was, we went ahead and placed an order. The shower head looked nice, but when it turned on, it was just amazing. Copyright © BathSelect. All Rights Reserved.